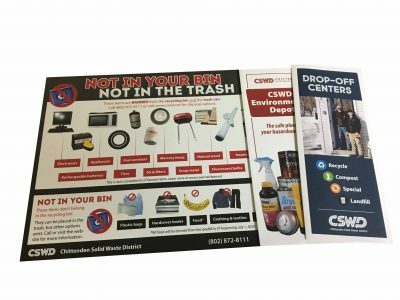 The brochures, posters, decals, and bins are available to residents and businesses of Chittenden County to help you reduce waste – and educate yourself and others about the proper management and disposal of common household items. The brochures and posters may also be downloaded or printed; see the View PDF version link below the description of any printed resource. Enter a quantity for any item you wish to receive; on the next page you will be asked to input your contact information so we can arrange for delivery or pickup of the requested items. 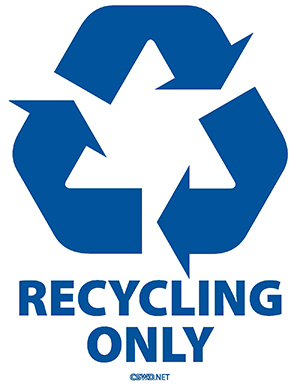 Up to three (3) recycling bins may be purchased at any CSWD Drop-Off Center. 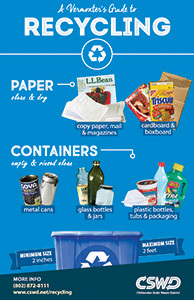 For larger quantities, use the Recycling Bin Request Form. 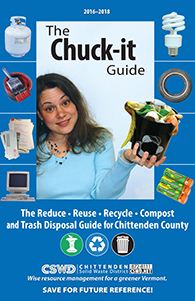 The reference guide to reuse, recycling, compost, and trash in Chittenden County. Published every 2 years. 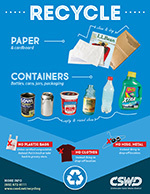 This half-page, double-sided recycling info sheet is designed to be hung on a fridge door for easy comprehension of recycling guidelines at a glance. 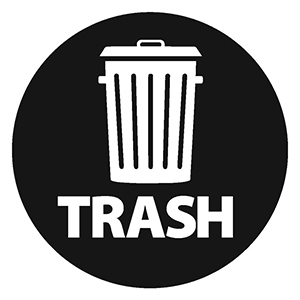 This decal is designed for use on recycling carts or bins for quick reference. 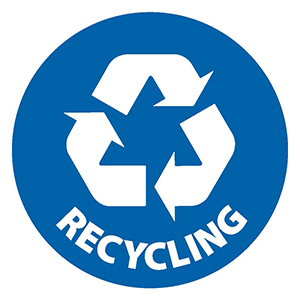 This decal fulfills CSWD labeling requirements for all carts and dumpsters that are not standard “recycling blue” or do not have a “recycling blue” lid. This poster makes a handy reference above a sorting station. This handy kit is designed for landlords to provide their residents with all the important information upon moving in. Pieces include the Chuck-it guide, Vermonter's Guide to Recycling and Composting, Drop-Off Center brochure, and a recycling decal. This handy kit is designed for landlords to provide their residents with all the important information when moving out. 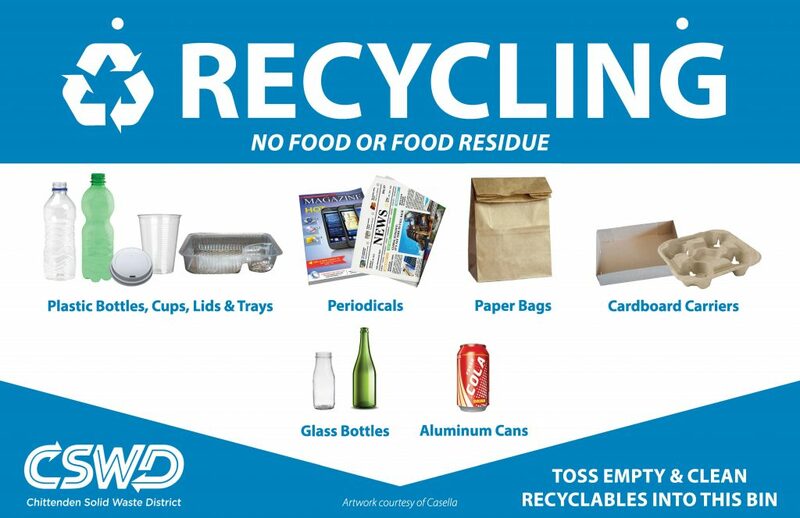 Pieces include the "Not in your blue bin, not in the trash" poster, the Environmental Depot brochure, and the Drop-Off Center brochure. A 4-fold brochure with an overview of what you can recycle, what you can compost, facilities for everything else that doesn't belong in the trash. This 4-panel brochure contains helpful information on all 7 CSWD Drop Off Centers (DOCs) around Chittenden County. 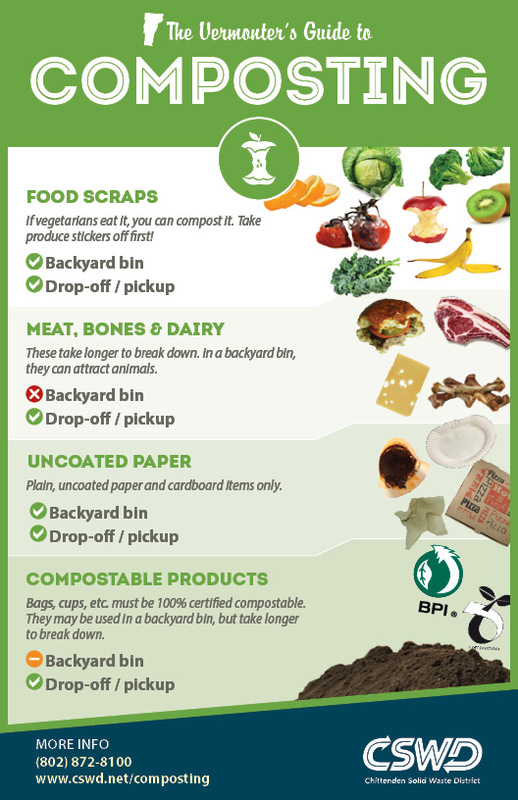 This tri-fold brochure is a step-by-step guide to managing food waste at home to create your own compost. 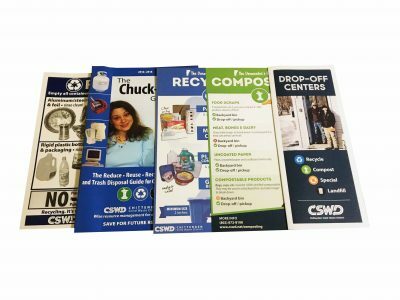 This tri-fold brochure is a how-to guide to using CSWD's drop-off composting program, including a list of items you can start keeping out of the landfill right now. 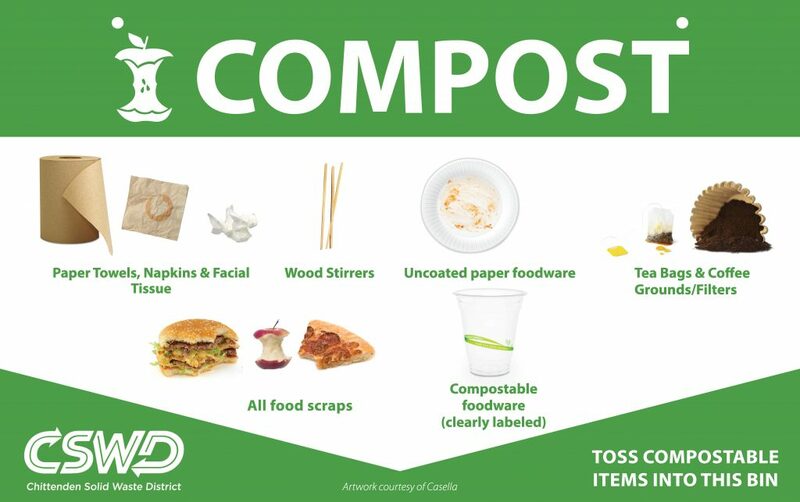 This flyer offers curbside pickup customers information on how to correctly collect compostable food scraps and paper. 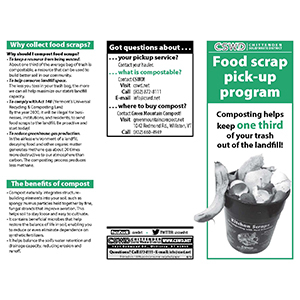 This bi-fold brochure answers FAQs, provides success stories and tips to collecting food scraps in an office setting. 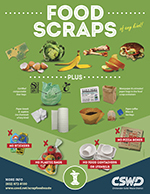 This tri-fold brochure answers FAQs, provides success stories and tips to collecting food scraps in a restaurant or food service kitchen. 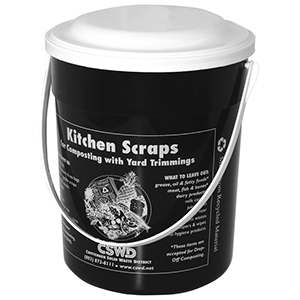 This 1-gallon bucket is a convenient collection container for food scraps and other organic materials - whether you're composting in your backyard or using the drop-off composting program. 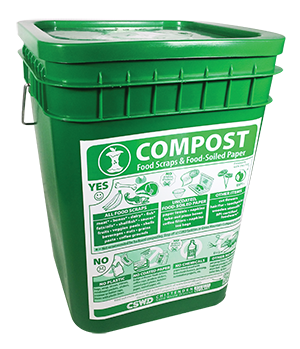 This convenient 2-gallon countertop compost collection pail makes it easy to save food scraps at home. 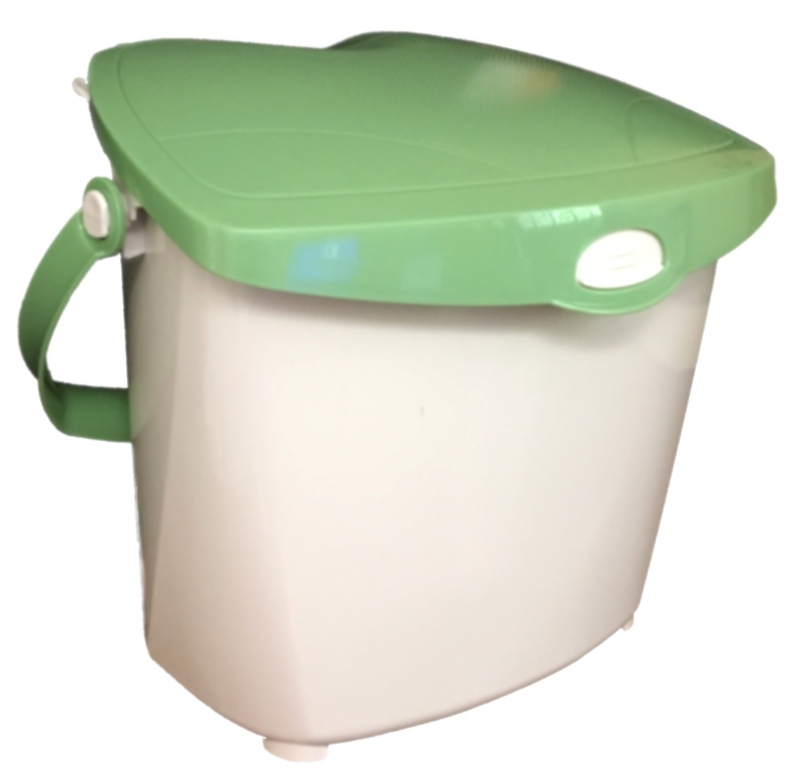 With a latching lid to control odors, it also comes with a sturdy handle for easy transport. These can be purchased and picked up at Green Mountain Compost for $5.00. This 4-gallon bucket is for use with our drop-off composting program at a CSWD Drop Off Center or Green Mountain Compost. Comes with Compost bucket decal attached. For use in households, food-service kitchens, and offices. 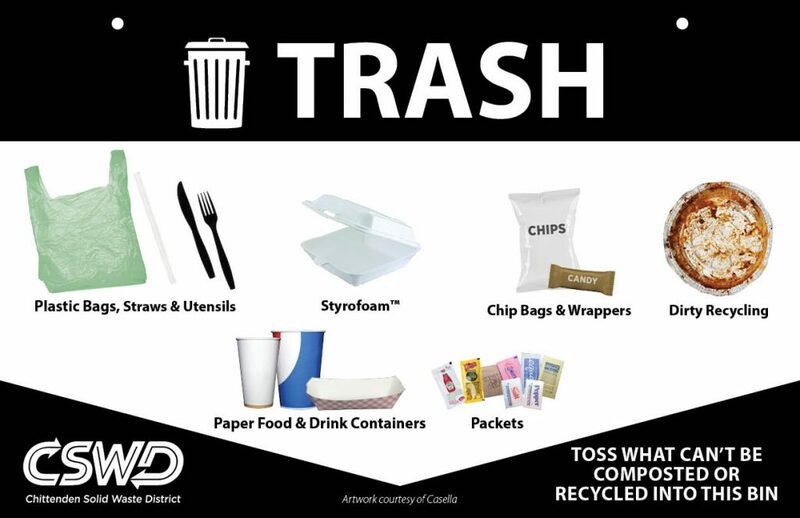 This decal is designed for use on a food scrap collection container as a quick reference to what is compostable and what is not. 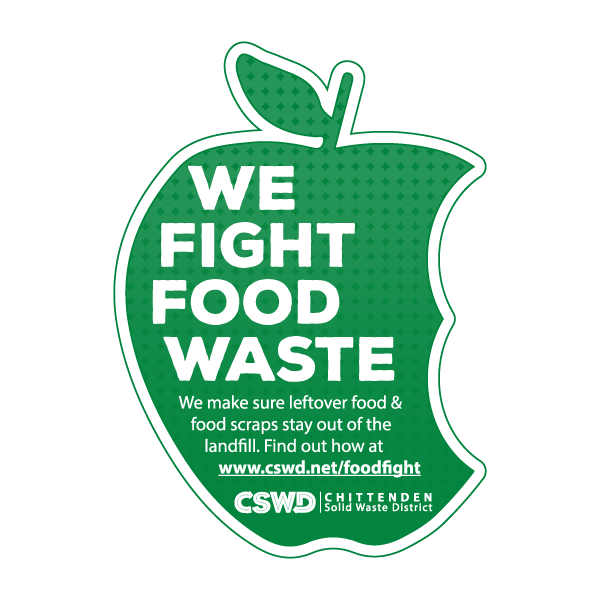 This half-page, double-sided quick reference sheet is designed for use on a fridge door or other visible area close to a food scrap collection location. 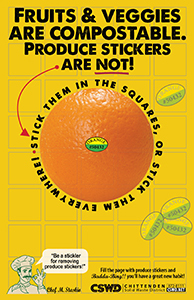 This half-page poster is designed for hanging on a fridge, to help remind you to take produce stickers off of fruit before you put the peels in the compost bucket. This sticker helps to clearly label the place for recyclables. This sticker helps to clearly label the place for landfill-bound trash. 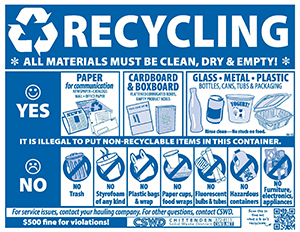 This vinyl label illustrates correct container use with words and pictures, and meets District requirements for trash container labeling.Dimensions: 11"x8.5"
This vinyl label illustrates correct container use with words and pictures, and meets District requirements for recycling container labeling. This tri-fold brochure is a brief guide to "the safe place for your hazardous wastes," including a list of common materials the Environmental Depot accepts. Basic info is also included in the Chuck-it Guide. This 4-panel brochure covers disposal & recycling requirements for C&D materials, including facilities that accept them. 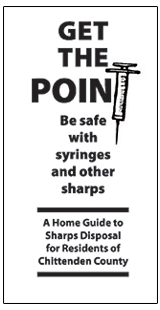 This bi-fold brochure helps people understand how to safely dispose of sharps & syringes. This sticker, printed on neon orange paper, is designed for use on a plastic container that safely contains needles & syringes for disposal. It alerts waste handlers that syringes are present and that the container should be placed in the trash. This translucent window decal is for any restaurant or business that keeps food out of the landfill - by donating leftovers, sending food scraps to farms, or by composting. Requires confirmation of diversion program by CSWD staff. 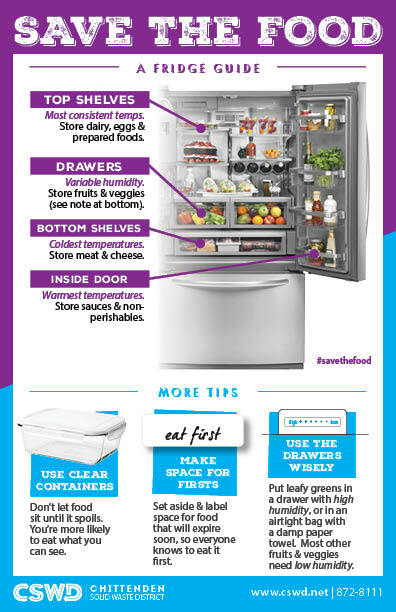 Dimensions: 4.3"x3.2"
Two-sided fridge hanger with helpful tips to using your fridge wisely, and storing fruits & vegetables to make them last longer. Dimensions: 8.5"x5.5"
Poster for placement over compost collection container at events. 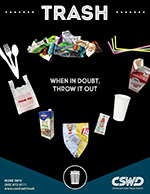 Poster for placement over recycling collection container at events. Poster for placement over trash collection container at events. 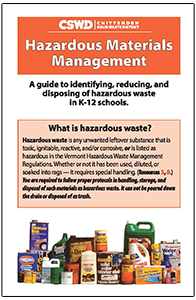 A bi-fold guide to identifying, reducing, and disposing of hazardous waste in K-12 schools. 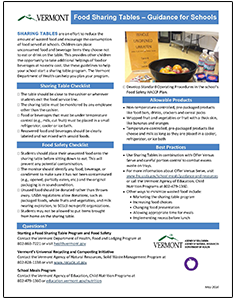 A one-page guide to creating a food-sharing table in schools, with checklists and best practices. Developed in collaboration with Vermont Agency of Natural Resources and Vermont Department of Health. Informational brochure about Vermont's premium recycled paint, made in South Burlington, VT.
Ex. Casella, Myers, Clean Green, Gauthier's, Duffy's, etc. 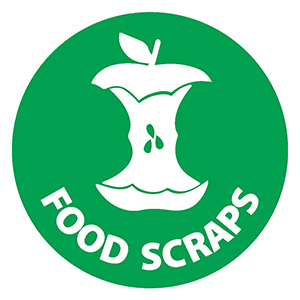 Do you contract with your hauler for food scrap collection?